Raised in Indonesia I was fascinated and inspired by the richness of the culture in its various art forms. Balinese dance, Batik patterns, and traditional Javanese clothing are fundamental elements and influence of my work. I am also interested in playing with and portraying the submissive nature of most traditional Indonesian women. I work mostly with oils on canvas and linen, using the effect of continuous layering to give my paintings an illusion of depth. I am using gold leaf in my most recent work bringing unique patterns to life, inviting a contemporary element into them. 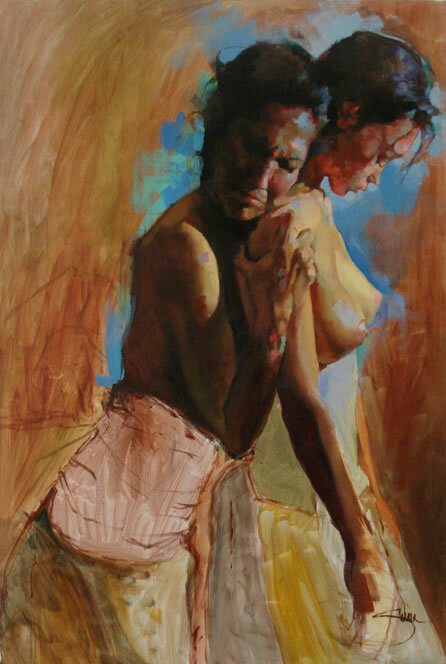 The focal point of my compositions has often been exposed flesh of women figures accentuated by the use of light and shadow. the history of the fashion. I’m continuously stimulated by artists such as Carravagio with his use of light, Rembrandt and Rubens for the way they portrayed flesh, Jan van Eyck and Velazquez for their extreme attention to detail and so many more.The collection of Gustav Klimt and Egon Shiele continue to challenge the comfort ability in my style of painting and motivates me to explore different avenues such as abstract. Other artists that have taught and influenced me personally are Marilyn Guerinot and Kartika Affandi. Both contributed an element of looseness in my work and encouraged me to not be afraid of the canvas.